Kills 99.9% of all viruses and bacteria. Reduces the need for chemicals by up to 90%. Is 200 times more powerful than chlorine. Breaks down oils, cosmetics and human contaminants. Unlike traditional chemicals, does not cause skin and nasal irritation. Is odorless and breaks down the byproduct odors of chlorine and bromine. Eliminates foaming “bathtub ring” & environmental worries. Requires fewer water drainings than a hot tub with other sanitizing chemicals. 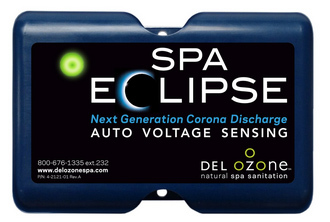 The Spa Eclipse Next Generation Corona Discharge system matches the capabilities of the High Output units at a fraction of the size. Featuring DEL’s exclusive Advanced Plasma Gap technology, the newly engineered design is now equipped with Auto Voltage Sensing. Higher ozone output and longer life than other CD technology, the DEL Ozone Spa Eclipse is the ultimate solution for water treatment in hot tub applications. Considerably more energy efficient than UV ozone generators, the Spa Eclipse is lower in overall power consumption, heat generation and operating cost. An Ozone Generator, also called Ozonator, will make a big improvement in the water quality, and reduce chemical usage. It will provide oxidation and reduce chlorine usage even more. Ozone is the most powerful and arguably the safest sanitizer available. However, ozone oxidizes very quickly and does not leave a residual in the water so it's only working while the system is turned on. A minimum residual of chlorine should be used with ozone systems. Use with OneShock or dichlor per label instructions to kill any residual or resistant microorganism. Maintaining clean and clear hot tub water can be a challenge for even the most experienced hot tub owner. Most hot tubs are built with an ozone generator which works with chlorine to create crystal clear water that is safe, sanitized, and readily enjoyable. Yet, what happens when you find your water chemistry out of balance and your water cloudy? It might be time for an ozonator replacement. When is it time to replace your Ozone Generator? Figuring out for yourself if your ozonator needs replacement is not as simple as you might expect. Some people will tell you to look for an "on" light or "check for bubbles" and, for sure, these checks may help you determine if the ozonator is on, but it doesn't necessarily tell you if the ozone generator is producing ozone. A hot tub ozone generator may keep running long after it expires (stops producing ozone) so you will need to look at other factors besides just power to the ozonator. Assuming your ozonator has power, the key is determining if it is producing enough ozone to be effective. When an ozone generator is near its expiration the ozone levels it produces may not be high enough to keep your water looking and feeling its best. Does your water look and feel like new? With a working ozonator and the proper chemical balance, it should. Do you find yourself continually upping the amount of chemicals you use in an attempt to fix your water quality? This is typical of hot tubs that need an ozone generator replacement. Are you having trouble balancing your water chemistry? Adding chemicals may just add to the problem. Have you replaced your hot tub ozonator in the past 2 years? Ozone generators typically last 1-3 years, depending on the type generator and how is managed by the hot tub electronic control (Spa pac) .